Matchbook is definitely the fastest growing sports betting exchange in the World. The owners have recently invested quite a lot of money in the website rebuild. They also hired number of new staff in their offices in Ireland. Those investments have started to pay back with really solid improvement in product. Their exchange liquidity is growing and they even introduced casino offering. This betting exchange is licensed in the UK so you won't get into any problems playing there. It's usually the case that betting exchanges are not really giving away big bonuses. Matchbook is not really following on this rule. They are now offering a pretty decent exchanges bonus of £50 in form of cash back. In order to get your Matchbook Cashback you will need to collect Matchbook points. For each £100 won or lost on the exchange (or each £5 paid in commission) you will get 1 Matchbook point. For each 5 points you will get a £5 in cash to your account. Maximum bonus you can get this way is £50. The maximum period for collecting the points is 5 weeks. The bonus is available to customers in the UK. You can also use it from Australia, Austria, Denmark, Finland, Germany and Ireland. Japan, Netherlands, Slovenia, Sweden and Switzerland are also included. Definitely worth to consider this Matchbook welcome offer if you are from one of those countries. Please note this video instruction for Matchbook exchange is a bit out of date. It still feature the £25 offer. The £50 welcome bonus in form of cash back that we described above is the current offering. The other steps are all valid so it's still worth to take a look! As mentioned earlier you don't need any bonus code when you register with this company. Their welcome offer is available to all new customers. This is the biggest offer on the market and using bonus code won't change anything. 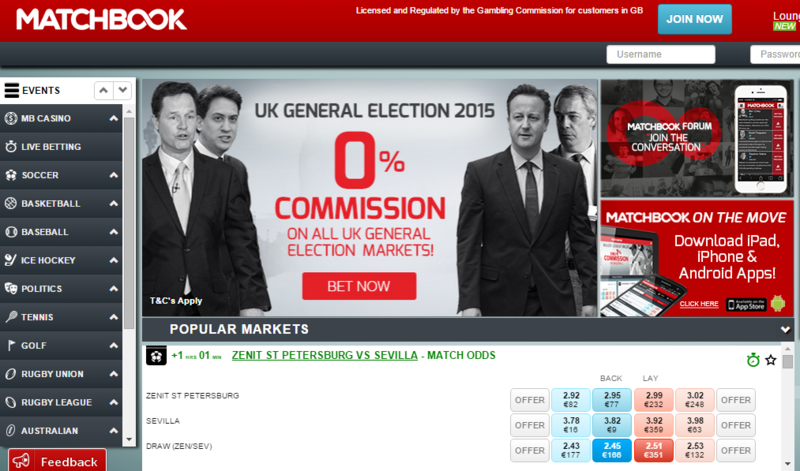 Matchbook sports betting exchange offers number of lower commission promotions. They give 0.5% commission on all soccer Asian handicap markets. On top of that they give also 0% commission on some special markets for bigger games or non-sport events. Just for example they were offering a 0% commission deal on the ICC World Twenty20 in cricket. They also offers a of special promotions on Premier League games. They will surely do the same for Euro 2016 tournament. There's a good news for all horse racing fans. Matchbook betting exchange is now offering horse racing betting. The product is still not as good as Betfair or even Betdaq but the liquidity is improving every day. What is even better they are now offering a 0% commission on all horse racing bets from now until end of July 2016! If you're a big racing punter or trader Matchbook might still not be the best choice for you. It's improving every month but still a way to go. If you're looking to make a few bets on football, tennis or American sports we recommend their exchange section. Betting exchanges normally don't focus on any free bets or bonuses. Instead of that they are giving away lower commission deals on sports and markets. 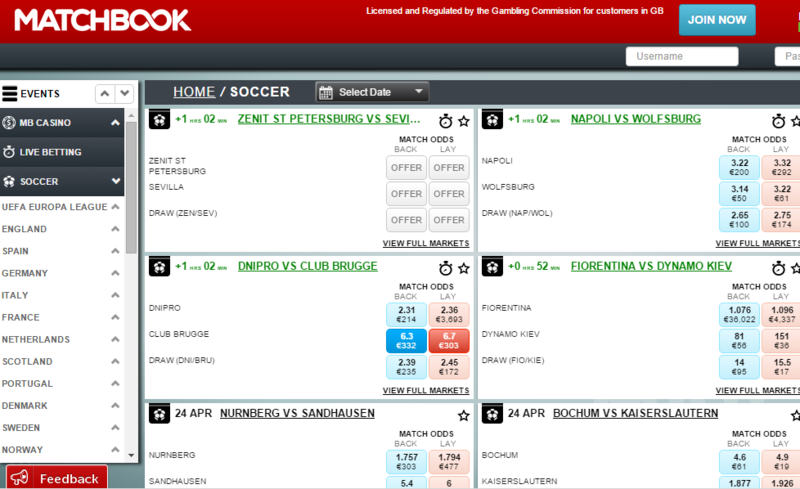 Matchbook is currently offering 0.5% commission on all soccer Asian Handicap markets. While this company doesn't offer the biggest number of betting markets their margins are definitely attractive. In average this operator should be offering slightly higher odds that even some of the leading bookmakers in this area including bet365 or Marathonbet. 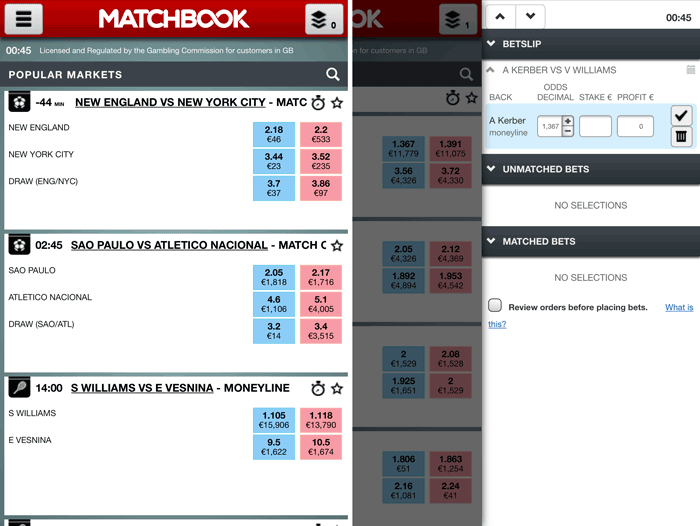 Matchbook might struggle to get enough liquidity on some smaller sports but even for bigger punters they should be more than fine for football betting. Matchbook is mainly known from their strong american sports offering. If you like NBA or NFL it's definitely the place to go. Their american sports liquidity is often higher than Betfair's. With far lower commission it's a wise step to test Matchbook. Matchbook is a betting exchange. That means this company doesn't limit your stakes or potential winnings. Your largest bets and potential winnings depend only on available liquidity. As long other players place bets on exchange you are fine. This betting exchange only offered some basic games up to recently. After a lot of work this section of their website has greatly improved. We can now use some of the leading online casino games from the leading provider – NetEnt. According to the news from their offices it's only the start of the improvements in this area. We should see even better casino product quite soon. Matchbook website is a quite recent development. The site doesn't really look like traditional sportsbook or even traditional exchange. It has a big focus on some featured events that usually have really good liquidity. The other betting markets can be found from a quite good navigation menu. It's definitely not the best betting site you can imagine. Yet, it's unique and if you spend some time on it you can find it quite handy and useful. Matchbook focused a lot of their efforts on their mobile app. They have produced apps for both iphone/ipad and android devices. While it might not be the best app you have ever seen is definitely one that does it's job. It's easy to navigate and allows users to quickly find the betting market they want. Matchbook is offering customers service by phone, email and live chat. The UK phone number is +44 203 642 6867. The email is [email protected] Live chat is available from the site between 9:00 am and 3:00 am UK time Monday to Sunday. They allow deposit and withdrawals through credit and debit cards, Neteller, Skrill, Instadebit and paysafecard. We haven't heard anything about potential withdrawal problems with this company. It's a UK licensed sports betting exchange. It's recently becoming a better and better alternative for Betfair. It offers attractive commissions and really looks after its customers. The negative part about their offering was the fact that they haven't had any offer for horse racing at all. It has changed recently and now you can place racing bets including ante post on their site. You are football or American sports fan? You like to get higher than average odds and the option to back and lay teams? Then it's definitely a place for you. You're a football fan looking for some better margins? You want to get more out of betting than with traditional bookmakers like bet365 or William Hill? It's also a good place for you! 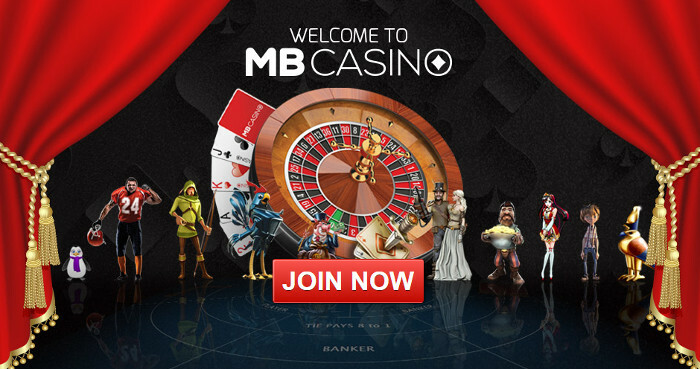 You don't need any Matchbook bonus code to register with this company. Just use one of the links on this review to visit their page. This way you will get your welcome bonus without any registration code.